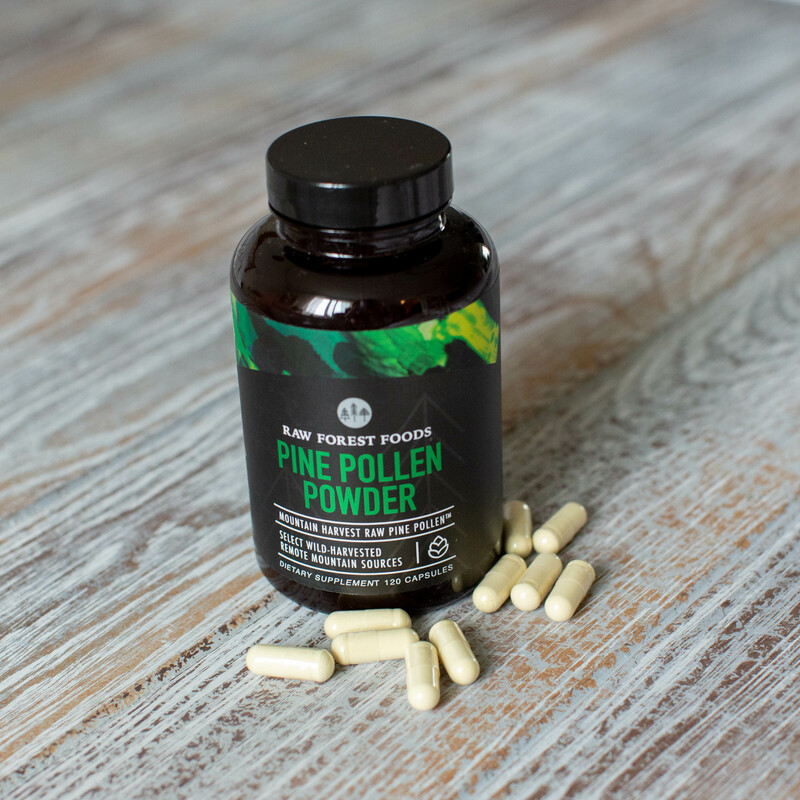 Our RAW Pine Pollen Capsules contain the same high quality, high integrity Mountain Harvest Pine Pollen that you can find in our full line of products. 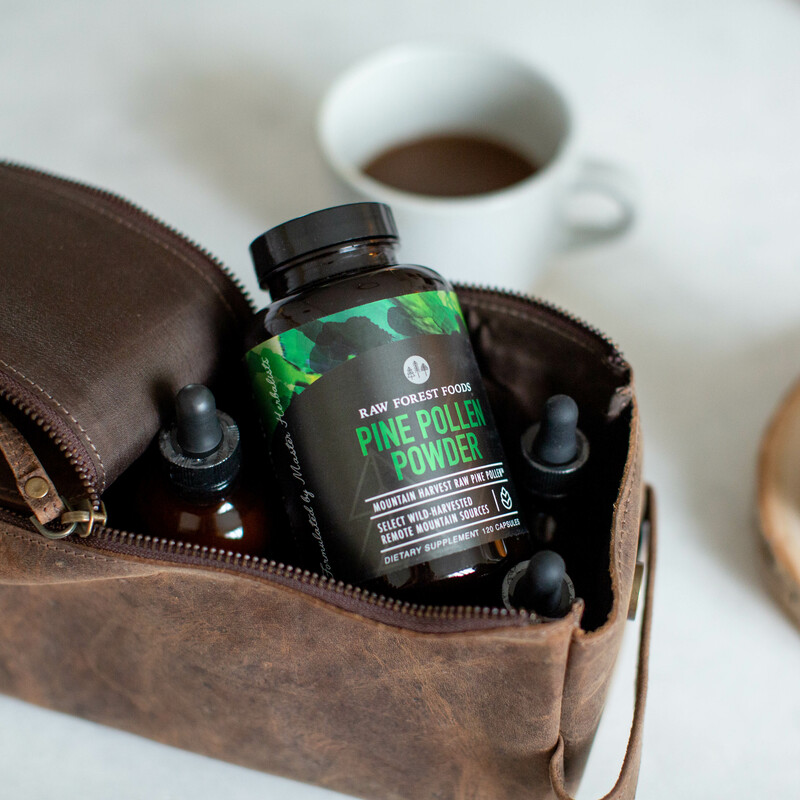 Pine Pollen Capsules make it exceptionally easy to ingratiate Pine Pollen into your daily routine since all you have to do is take them—no mixing, no blending, no further preparation required. RAW Forest Foods was founded with the simple goal of becoming the first domestic source for Pine Pollen. Over a half-decade later, we are proud to be the premier source for the full line of Mountain Harvest Pine Pollen, and we are proud to be able to leverage our over half-decade of experience to source and ensure that customers receive the highest quality products available. 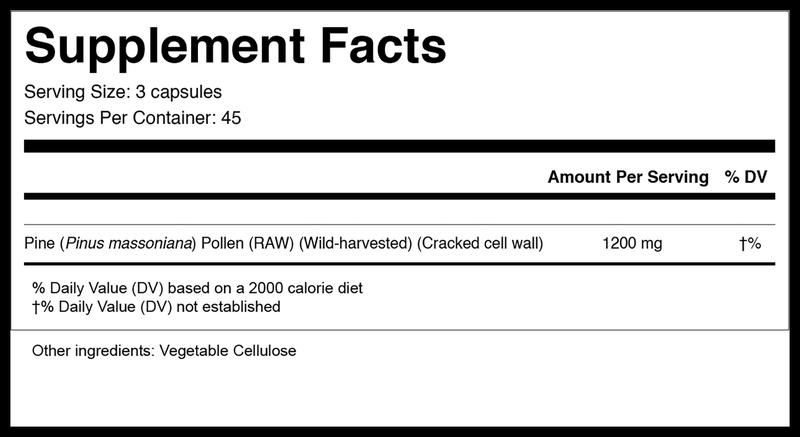 Our updated RAW Pine Pollen Capsules contain an increase of 66.6% more RAW Pine Pollen than our previous capsules. That's huge. Each Spring our Pine Pollen is wild-harvested deep in the foothills of the Himalayan mountains. Working with a forest conservation co-operative, this Pine Pollen is gathered using traditional methods, at the peak of potency, from select Pinus massoniana pine trees. These remote, clean forests provide the highest integrity Pine Pollen possible. In the wild, Pine Pollen fulfills two roles. Firstly, the pine catkins produce the pollen to germinate and reproduce. Secondly, each spring the pollens coats the dormant forest floor, where the many nutrients and growth factors present in the pollen nourish and awaken the forest plants, bringing about the lush green growth that transforms the barren winter into the productive spring and summer. Within us, Pine Pollen aids a similar transformation. Over 200 beneficial compounds have been identified in Pine Pollen, containing a complete array of essential and non-essential amino acids (beyond being just a complete protein), it contains many, many living enzymes and enzymatic co-factors, vitamins, and minerals, and other important factors to promote health and healthy aging, including anti-inflammatory agents, antioxidants, adaptogens, pro-androgenic and phytosterols (plant hormones similar to testosterone), and beneficial growth factors. Because Pine Pollen is almost completely indigestible by humans, we lightly process our Pine Pollen to increase its digestibility and subsequently increase its potency, while retaining its raw, living state. Unique, food grade packaging inspired by the ingredients contained within. View our Mountain Harvest RAW Pine Pollen Powder capsules quick facts PDF. Each bottle contains 120 vegan/vegetarian capsules (made using plant cellulose) of the same RAW Pine Pollen available as a powder. The opaque, dark color of the bottle protects the Pine Pollen from UV rays and helps to keep the contents dry. All RAW Forest Foods packaging is food grade and done domestically in our certified organic, FDA cGMP facility. The bottles our capsules contain within are 100% reusable and recyclable. To reduce redundancy, we have compiled the following pages with specific, in-depth detailed information about Pine Pollen. Additionally, our RAW Pine Pollen Powder product page provides additional information. The serving size is 3 capsules, taken twice daily or as otherwise directed. This product contains the same fractured cell wall Pine Pollen as our RAW Pollens (Pine Pollen, Camellia Pollen, and Brassica Pollen). The new and improved pine Pollen capsules are amazing! I definitely feel a quick difference in my well-being, as I have to monitor lower than average testosterone levels. Love this company. First time I bought was back in 2010 and still very satisfied with their quality. Great product. I noticed a difference in my health within a month. I feel energetic and my mind feels a lot more clearer. I've used many of the products from RAW Forest Foods and they are all outstanding. I'm reordering the capsules right now (along with Estrogen Detox) and excited about all the new packaging. I can only recommend this fantastic product. Its a great good feel factor to use this product like the ancient did. Within a week of using this product you will feel a huge upbeat in all aspect, mentally, physically but more import in generates a aura in you life you don't want to miss. Great product for active people! Disappointed that this product has been out of stock for so long. I have been waiting to reorder for sometime now. While I love this product I have to give them only a three star review because I want to order it but it is out of stock. I will be ordering the extract capsules instead. Having taken the Pine tree pollen for two years I find capsules much easier for me. I'm an martial artists and find that when I travel to seminars this is way easier way to carry them around. They work great to help my body recover from training and I use them every day to help my mental physical and spiritually well being.